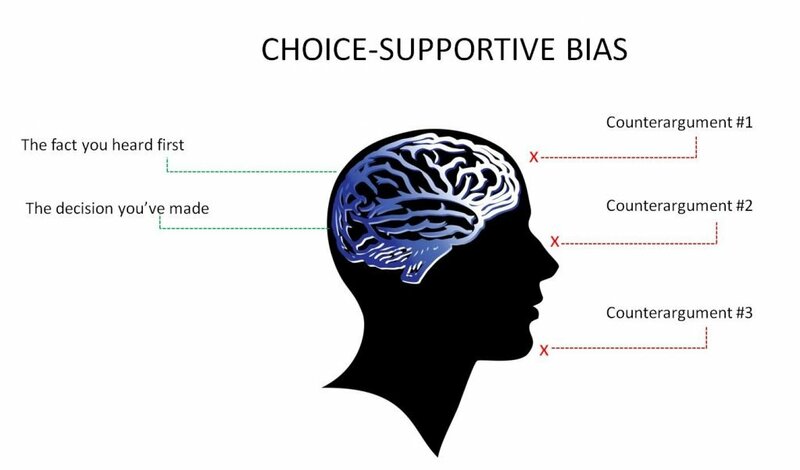 Choice-supportive bias (or post-purchase rationalisation) is our tendency to defend our own decisions or later perceive our choices as better than they are simply because we made them. This is why it is usually counterproductive to criticise people for their decisions as it makes them defensive and they will often seek to justify their decision whatever you say to them. Research indicates that the vast majority of our decisions are made by our subconscious brain and that activation of the brain’s reward centre is a much better predictor of purchase decisions than subjective liking. As a result people do not have full access to why they make most decisions and so the brain automatically creates reasons after the event to support self-perception . Research studies have shown that positive aspects of a choice tend to be recalled as part of the decision process, but negative aspects tend to be associated with the rejected options. When customers make a decision, reward them with praise as this helps to reinforce their perception that they made the right choice. Build positive messages into your conversion funnel and use your confirmation email to congratulate them their purchase. Don’t rely on asking people direct questions to understand what drives people to buy as they don’t have full access to their underlying motivations. Instead, use implicit research techniques such as the Implicit Association Test to identify psychological motives. Use A/B and multivariate testing to validate changes as a result of your research as people are poor at predicting their own behaviour and a website is a complex ecosystem. I told you it was right! Avoid criticising other people’s decisions as they will become defensive and come up with a justification whatever you say. Criticism just generates resentment and can demoralise people. Instead, use the Chris Goward approach and say “You should test that.” A/B and multivariate testing is the most scientific way of making decisions about website design and takes subjective opinions out of the selection process. We all make bad decisions and so be open minded and admitting you may have got it wrong earlier can limit the damage. In optimisation we try to use data and evidence to make the best decisions, but bear in mind not everything that is important can be measured. Over reliance on evidence driven rather than evidence informed decisions can result in you failing to move above a local maximum. One way of avoiding mistakes with optimisation is to always ask for two designs to test. One design should be based upon your interpretation of the hypothesis and the other can be the designer’s view of the hypothesis. Don’t defend bad decisions. One sign of a poor decision is the feeling of guilt or regret over a choice and looking for positives to support your decision. To avoid falling into the trap of confirmation bias take care to put more effort into finding and analysing data that contradicts your decision than you do with looking for information that supports your choice. Ideally you should not analyse the outcome of your own tests and instead have an analysist who is not involved in the development of tests to do the evaluation of results. We all suffer from choice-supportive bias as we don’t have full access to many of the underlying motivations that drive behaviour. As a result people post-rationalise reasons to support their decisions and seek to justify their choices. Assist this process by congratulating customers on their engagement with your website and use social proof to reinforce their perception they have made a good decision. Be careful not to fall into the trap of choice-supportive bias with your approach to optimisation. Use experimentation to avoid damaging arguments about which design is best for the site. Try to prove yourself wrong rather than confirm you are right.